Blue Monday – are we looking a bit Chelsea (away from home)? 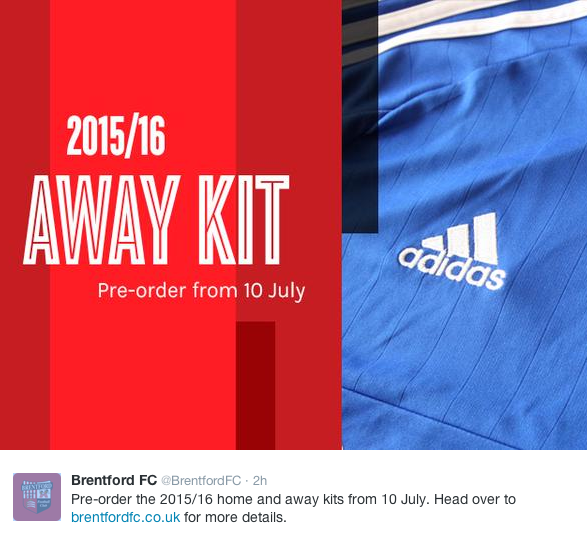 So after all the anticipation, the full design spec of the Brentford away shirt (expected to be revealed on Monday) remains a mystery. Of sorts. Instead of the full kit, we were treated to a teaser picture along with the description on the club site of “bold blue away shirts”. As fans awaited the long hoped for unveiling, at 3.45pm ‘official’ Twitter could only confirm : We are still waiting to get confirmation regarding the home and away kits. They could be fooling all of us, with the rest of the away kit revealed to be a mixture of salmon pink, charcoal and lime green. Although I was hoping for a baseball style kit if we were adopting Moneyball! Seriously I do like the black placket on the home kit. Im assuming that a placket is the bit coming down from the end of the collar? If so, placket’s is a brand new football related term for me, so my hat off to you Nick for introducing me to this fine word. Maybe placket’s will be to you Nick, like stanchion’s were to Jimmy Hill.